A smart industrial mobile phone with camera, barcode reader and touch screen that supports communication modules like Bluetooth, GPRS & GPS for rapid online and offline transactions. 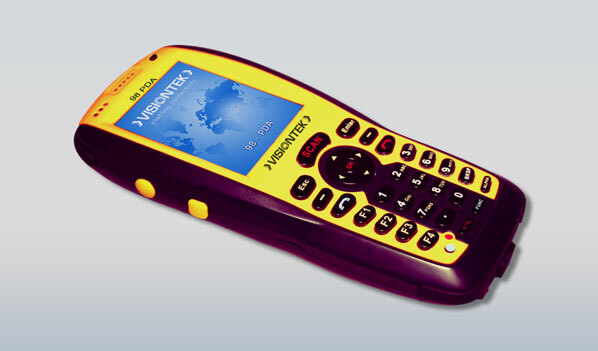 VISIONTEK 98 PDA, a device with camera and barcode reader, is a smart industrial mobile phone with touch screen that supports communication modules like Bluetooth, GPRS & GPS for rapid online and offline transactions. It is a compact and truly portable unit that supports a wide range of applications viz. Cash Collection, Retail Automation, Inventory Management, Sales Force Automation and KYC for Financial Institutions etc. 98 PDA, with a combination of extreme light weight, rugged and ergonomic design is easy to carry and operate thus making it a preferred choice for field use. KYC for NBFC, Banks, etc. VISIONTEK ePOS 91 Battery Charger kit is a desktop charger with 4-battery holder and external A/C power supply adaptor. It is a simple, user-friendly device that can operate for long hours without any hassle. The POS terminal user can, therefore, operate the charger 24x7, saving valuable mobile operations time and energy in the field, generating more revenues. VISIONTEK battery charger has a smart tri color LED indicator for each battery, indicating the charging status of the batteries - Red indicates nil battery charge, Orange indicates charging in progress, and Green indicates fully charged status. What more... the VISIONTEK Battery Charger kit is also equipped to automatically shift to trickle charge mode after the battery is fully charged to provide output shortage protection.